iOS 7.1, released earlier today, includes support for existing iPad models along with support for two unannounced models, labeled iPad4,3 and iPad4,6. It is possible that these new model numbers represent minor hardware revisions for existing iPads that will be introduced to the market silently, as a more substantial upgrade would push the model numbers higher. On occasion, Apple has implemented new hardware components for its iOS devices without a public announcement and these minor changes often go unseen by consumers as they tend to introduce very minor improvements in efficiency. For example, an Apple TV update in January of 2013 revealed a new Apple TV, which turned out to be a minor update with a smaller A5 chip. That change was not obvious to Apple TV purchasers, but it did warrant a model number jump to 3,2 from 3,1. 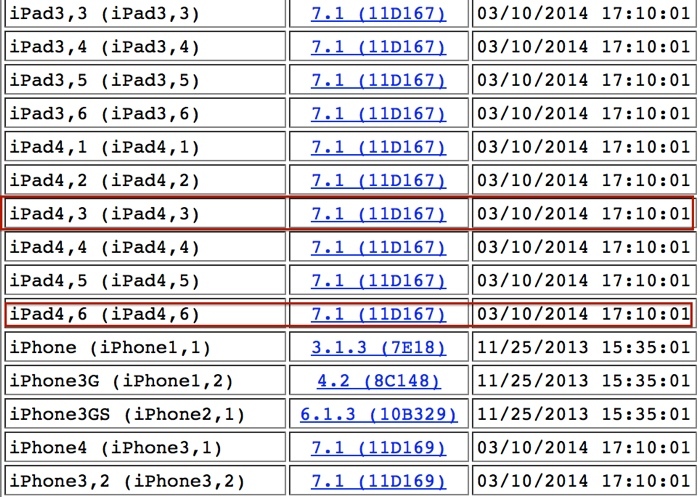 Existing iPad Air models are numbered 4,1 and 4,2, while Retina iPad mini models are numbered 4,4 and 4,5, suggesting one new iPad Air for the 4,3 designation and one new Retina mini for the 4,6 designation. As noted by 9to5Mac, it is also possible that iPad4,3 and iPad4,6 represent iOS devices that are optimized for networks in other countries. Maybe they're the models with 2GB of RAM, since 1GB is a joke. What can't you do on an iPad that you think requires more RAM? Endless animated gif scrolling on tumblr. Not that I condone using tumblr or anything. They're going to revise the iPad Air and rMini with 3gb ram, full color gambut screens, 32 GB min storage space, shaved off another 1/3 pound weight, 15 hour battery life, and Touch ID. It's going to be the bees knees and you really should have held out for it. TouchID for the iPads now that the sapphire shortage has been fixed. True new iPads come out later with A8. I am generally of the opinion that what comes out next should have no bearing on how you feel about your current device (a.k.a. something new doesn't make your current device suddenly less functional). Does anybody here really think that Apple is going to forge a new A7 chip packing a magical 2 GB of RAM for six months? And then the new iPads come out with iOS 8 and an A8 with 2 GB RAM in October?